Some of the original feedback on Blippy, the purchase sharing service that tracks your linked spending, said the service was about as exciting as reading old receipts. But as the service matures and gains new features, we are seeing the content expand, making the network a potentially vast repository for first-person reviews of brands, products or customer service. Just as Foursquare has learned, the simple act of a status update displaying one's location or item purchase is not enough to build a community or a company. Instead, it takes personality and emotionally-tinged feedback around that experience. For Foursquare, this content comes in through tips you can leave when you check in to a venue. For Blippy, this comes when you add a purchase and can describe what you bought, and whether you would recommend it to a friend. And if you see these reviews on Blippy, you can let the reviewer know what you thought of their update. Longer-term Blippy users have no doubt seen the frequent of a new mascot (a man in a unicorn costume) nagging them to review purchases. By heading to http://blippy.com/review/, one is prompted to "tell your story" quickly and move to your next purchase. From here, as with Foursquare, we can learn whether you loved that burger you chowed down, or whether you think you got ripped off by your cell phone provider. And you can see where this is going - massive user-driven feedback, accumulated by individual brands or products, to provide brands with subjective value, and to provide potential consumers with the same, either in aggregate, or from individual friends whose opinions you trust. 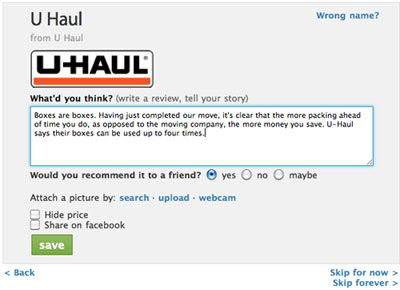 My quick review of a U-Haul purchase on Blippy. The resulting short, public, review on Blippy. As co-founder Philip Kaplan wrote me in an e-mail tonight after I pinged him regarding the updates, "The idea is to make it both easier for people to interact with each other, and have better "structured" data around which reviews are great, and why (funny/informative/weird/etc). We haven't used the data yet to make the site better, but it should be kind of awesome when we do." This direction becomes even more clear when you see any specific brand's page within the entirety of the Blippy network. 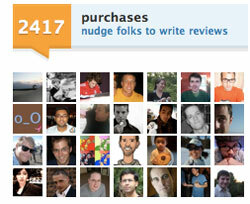 For example, when viewing the Best Buy page, you can "nudge" the 875 people who have entered updates from Best Buy on Blippy to write reviews of their experience. You can also nudge the more than 2,400 who downloaded the Foursquare app or the nearly 300 AT&T Mobile customers to do the same. Not unsurprisingly, companies like AT&T don't fare nearly as well as others, but when an entire community is pointing out issues with similar purchases, it can be used as a warning to future buyers within the network. Also new to Blippy of late is an amusing way to provide feedback to reviews. 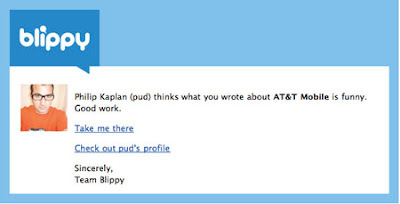 Rather than the "thumbs up/thumbs down" or +1 approach seen from many black and white feedback services, Blippy has stayed true to Kaplan's history and kept a humorous edge. One can click under any review to mark it as "awesome", "funny", "informative", "omgwtf", or simply ask to "tell me more". The simple action of clicking any of these options sends an e-mail to the reviewer to show somebody has interacted with their content, and bumps the review to the top of the network's reviewed items list, giving it another shot at people's eyeballs. The move to highlight reviews is such a big deal for Blippy that only shared purchases with reviews show up on the service's home page. No longer will you see a stream of non-active updates (as is often the problem of real-time services like FriendFeed or Cliqset), but instead, your entire feed will be made from updates where users have taken the time to tell you more. "We just launched this new design yesterday and expect to continually tweak the algorithm to show the best stuff on the homepage." Kaplan said. "Right now it's pretty simple -- the last review to be "acted upon" (commented, awesome'd, etc) shows up on top -- kinda like a message board where the thread with the most recent comment shows up first. But we may move to a more Digg-like feed, where the "most interesting" items show up first." Whether it be due to the highly-visible security bug that hit a small number of accounts a few months ago, one met with rapid response, or due to "Yet Another Social Network" fatigue, talk amongst industry watchers says the site has had less traction than originally anticipated, considering its market leadership and feature set, but Kaplan correctly says that a "ton" of purchases have been shared, and "the numbers look great". Site-wide data is now accumulated not just for brands, but users as well. For example, my Blippy profile highlights how often other users have tagged my reviews as "awesome" or "funny", and shows my engagement with the site, as the number of updates I've posted with reviews is shown alongside those without. No doubt the most engaged users who update their reviews more frequently with value can gain the visibility of the community and grow in stature. So too can Blippy grow in stature if the site's newest features are adopted by users, driving promote greater utility, engagement and community. For me, the combination of Foursquare check-ins, followed by Blippy updates, and now reviews, gives people a full circle view into where I am going, where I am spending my money, and why I am making those choices. If Foursquare is the first step to say you have arrived, then Blippy is the next step to show what you did there. Blippy may be the less understood of the pair, but the latest additions bring it ever closer to a powerhouse of real responses to real actions. It's not just that I "like" something, but that I paid for it. Now I am even more likely to tell you why. You can find me on Blippy at http://www.blippy.com/louisgray.